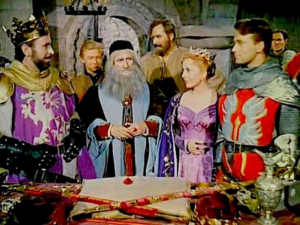 With the first season of The Adventures of Robin Hood a runaway success on both sides of the pond, the British ITV network called for a companion series, and Sapphire Films was happy to comply. Lancelot was made at the same studios as Robin Hood, employing the same writers and directors, and sharing actors, costumes, and sets. But despite this, the new series seemed to lack the spark of Robin Hood, and got off to a slow start. Star William Russell wasn’t as sharp or versatile as Richard Greene, and the initial episodes are flat, clichéd, and seem aimed at a juvenile Hopalong Cassidy level. The stories are reasonably well grounded in the Arthurian legends, though without using the actual tales, and with 100% less adultery. Oh, Lancelot and Guinevere make eyes at each other for the first few episodes, but then they dial it down and the knight takes up flirting with whoever is the lady guest star of the week. Merlin, as in Twain’s Connecticut Yankee, is a fraud and a charlatan, but here he’s a wise advisor who uses chemistry and optics to appear to cast spells. Lancelot, however, sees through his tricks, though he doesn’t reveal them, and takes advantage of his cleverness. Unfortunately, the limited budget means a smallish cast, which makes battles and sieges seem faintly ridiculous when conducted with five combatants per side. And though there are at least two sword fights in every episode, the swordplay is rubbish. However, halfway through the first season somebody seems to have noticed that the series was flagging and decided to do something about it, because after episode 13 the scripts show a marked improvement. Russell doesn’t get any better, but the stories suddenly come alive, the situations are more complex, and the characters show some depth. Furthermore, starting with ep 16, the series is shot in full color, a first for a British TV show. Alas, it must have been too little, too late to save the series, because it wasn’t renewed for a second season.